at the team training in Campinas. I AM writing this on the morning of Saturday, June the 14th, 2014 in my hotel room in São Paulo. At this very moment, Nigeria's Super Eagles are preparing to leave their World Cup camp in Campinas for Curitiba where they will confront Iran in their opening game of the 2014 FIFA World Cup on Monday, 16 June. On Friday, 13 June, I had finally made contact with the Eagles following the disappointment of the first day of their arrival when we (the Nigerian media corps) were denied the opportunity of receiving them at the Garulhous International Airport. This time, there was no denying us as the team held their first open training session to which members of the media and the Brazilian public were given free access. More journalists had arrived from Nigeria to join the corps at Santana Gold hotel, so it was a full house in our 13-seater bus as we embarked on the trip from São Paulo to Campinas. Notable among the new arrivals were Toni Ubani (Vanguard newspapers), Chris Okpara (The Guardian), Adekunle Salami (The Telegraph) and Kazeem Tijani, editor of the weekend editions of Complete Sports. Pius Ayinor (The Punch) had sat next to me in the press tribune at the opening match between Brazil and Croatia in Itaquera, but he wasn't on this particular trip to Campinas. I was particularly glad to see Kazeem Tijani who is actually the "official reporter" for Complete Sports at this World Cup. Yours truly only came along for the ride! Ha-ha. The Eagles' Vitoria Hotel base in Campinas was a beehive when we arrived. Security was heavy but relaxed as local Brazilian fans and a few resident Nigerians waited with smartphone and i-Pad cameras at the ready for the players to emerge. Mikel Obi was the first to come out to a loud cheer and flash bulbs as the players filed into the bus. Osaze Odemwingie who took time to take a few pictures and sign autographs was the last to board as coach Stephen Keshi hurried him up. I was well positioned at the bus entrance, so I was able to record the full procession for Complete Sports YouTube channel. The ride from Vitoria Hotel to the Guarani Football Club stadium, venue of the training session, took just ten minutes. We arrived to find that a few thousand fans were already waiting to receive the Eagles. "Nigeria! Nigeria!! Nigeria!!!" they chanted. For many of them, this will be closest to experiencing the World Cup first hand as no matches will be played in Campinas, an impressive city on its own, though a far cry from the hustle and bustle of São Paulo. The Eagles got down to business immediately as the "possibles" took on the "probables" while Keshi and his assistants looked on. Apart from Juwon Oshaniwa who has taken over injured Elderson Echiejile's position at left-back, and Ramon Azeez who has forced his way into the midfield, the other players on the "possibles" were the same that we had got used to in the last one year as Keshi's first teamers: Vincent Enyeama, Ambrose Efe, Godfrey Oboabona, Kenneth Omeruo, Mikel Obi, Ogenyi Onazi, Ahmed Musa, Victor Moses and Emmanuel Emenike. Unless something dramatic happens before kick-off against Iran, that is the line-up we are likely to see in Nigeria's opening game of this World Cup. After the training session which was divided into two halves of 45 and 30 minutes respectively, the team's media officer Ben Alaiya came over to invite the media corps to chat with the players. The FIFA official attached to the team initially hinted that only two players will be selected to speak on behalf of the whole team but, to everybody's relief, Alaiya came over to announce: "Gentlemen, you can talk to all or any of the players that you like." At last, we had caught up with the Super Eagles! The Nigerian media corps had been joined by other international media and nearly everyone made a rush for Mikel and Moses, in particular. In the process, everyone (repeat, EVERYONE) missed the team coach Stephen Keshi who sat quietly in one of the dug-outs as night descended on the stadium. Or, maybe they didn't miss him. They must have decided, and rightly too, that the players were the major news makers. Even I didn't notice the Big Boss until he called out to me: "Mumini, mo wa nibi o!" (Mumini, I'm here!). I walked over and we greeted warmly. While my colleagues were focused on the players, I stole an exclusive chat with the coach. Keshi was still sad at the loss of Echiejile to injury. "We're going to miss him because he is one of our key men," he lamented. "But thank God Juwon (Oshaniwa) is beginning to gain confidence and I hope he will keep it up. I just pray that we don't have any more injuries. That would make things very difficult." I observed that Azeez seemed to have tied down a starting place but trust Keshi not to give anything away when talking to a journalist, friend or no friend. "Yeah, he (Azeez) has been working hard like the others, so we will see (if he starts against Iran)." Finally, I asked Keshi about his specific plans for the Iran game. "Frankly speaking, I'm just focused on my team," he said. "I know that they like to stay organised in defence and midfield, so they rely mostly on the counter-attack up front. I know also that they have a very experienced coach (Carlos Quieroz), so it will be a technical game." "You are also a very experienced coach, Keshi," I told him not only to boost his confidence but also because I believed it to be true. He thanked me for the compliment. 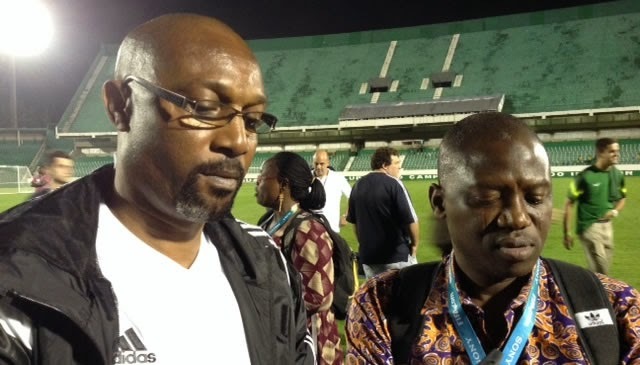 By this time, the media corps had eventually discovered where Keshi was seated and they swarmed all over him. Nigeria's Colin Udoh led the charge with his SuperSport cameraman and I quietly moved aside to allow them do their thing. Keshi answered all the questions thrown at him with his usual calmness and confidence. His team will need lots of those characteristics when they open their World Cup campaign against Iran in Curitiba. 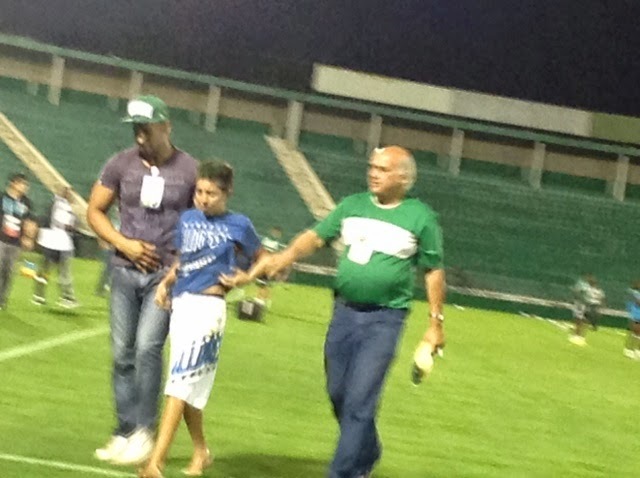 One of the young pitch invaders being led away from the Eagles training pitch.